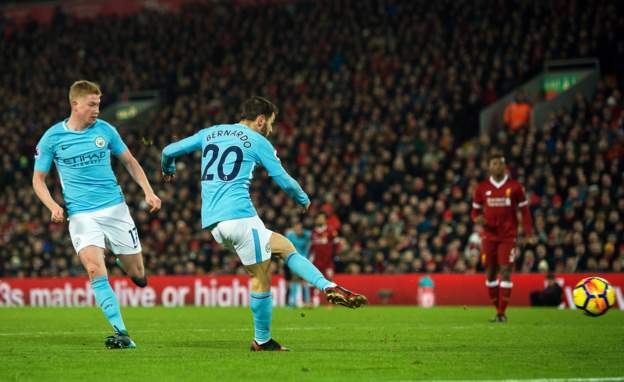 Manchester City’s 22 game domestic unbeaten run came to a dramatic end as they were beaten 4-3 at Anfield thanks to goals from Alex Oxlade Chamberlain, Roberto Firmino, Sadio Mané and Mo Salah. Oxlade-Chamberlain has been heavily criticised for his goal-scoring woes over the course of his career, having scored only nine Premier League goals in seven seasons before his August move from Arsenal, but the Englishman opened the scoring with a drivestrike from outside the area. Though Liverpool spent the majority of the first-half on the front foot, they found themselves level at the interval. Sane, who has scored seven Premier League goals this season, brought the ball down off his chest and jinked his way past Joe Gomez to shoot at Loris Karius’ goal. Karius, replacing Simon Mignolet in the starting XI, was beaten at his near post by the German winger. City found themselves behind once again early in the second half, as Roberto Firmino beat Ederson with a sumptuous chip. John Stones was shoved off the ball by the Brazilian striker, and as the goalkeeper rushed towards him, the ball trickled into the net. Just two minutes later, Liverpool led 3-1, as Sadio Mané smashed the ball into the top corner having hit the post a matter of moments earlier. Manchester City were staring down the barrel of a first Premier League defeat in 2017/18, and though they responded with panache, they were powerless to stop a red onslaught. Ederson’s quality as a ‘sweeper-keeper’ has been praised consistently thus far in his time at City, but he misplaced a pass from outside the box straight to Mo Salah, and found himself chipped for the second time in the game, though the Egyptian’s forty-yard effort was slightly more impressive than Firmino’s minutes earlier. City did respond through Bernardo Silva’s thunderous strike from inside the area seven minutes from time, while Ilkay Gundogan set up an incredible end to the game with his goal in added time. 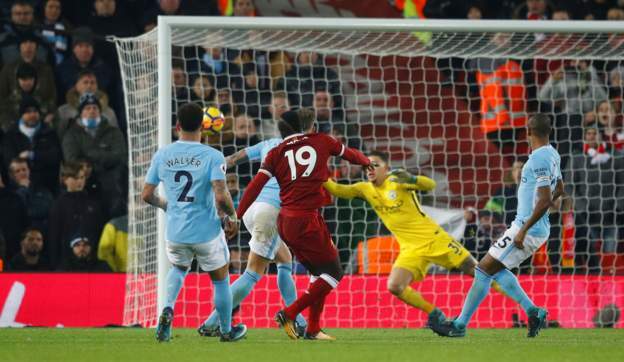 Aguero’s header hit the side-netting just seconds from time, but Liverpool’s performance was deserving of three points. Mané and Salah both have exhilarating pace, and City’s defense struggled to cope throughout the encounter. Oxlade-Chamberlain also added to their woes, with some strong runs from central midfield. Fabian Delph found himself out of his depth, and it was possibly a blessing in disguise when he had to limp off after 30 minutes, though Guardiola now finds himself with no recognised left backs in the Premier League squad. Perhaps the biggest cheer of the day came when Raheem Sterling, who left Merseyside bringing such vilification in 2015, was replaced. Sterling was surprisingly ineffective, given his new-found goalscoring exploits under Pep Guardiola. City are still 15 points clear at the top of the Premier League, and remain in all three cup competitions. This defeat shouldn’t discourage them, it should serve as a reminder that they’re not unbeatable. Liverpool’s performance, on the other hand, can be used as a blue-print for any side that faces the ominous City team. In their first game since the departure of Phillipe Coutinho to Barcelona, Liverpool’s attackers more than made up for his absence. That’s not to say it wasn’t felt – Klopp’s side did struggle to find a final ball at times in the first half, though in scoring four goals against the best defence in the league they did something no other side has done this season. They did this through the incredible energy of his midfield trio – Wijnaldum, Oxlade-Chamberlain and Can dealt with City’s many attacking threats, while at the same time giving the opposition defence problems of their own. Defensively, Liverpool were solid until they ran out of energy, even without the injured Virgil van Dijk. Andy Robertson was able to cope with Sterling’s pace throughout, while Joe Gomez – just 20 years old – defended Leroy Sane admirably over the course of the 90 minutes. Liverpool now find themselves in third, behind Manchester United on goal difference only, and a Champions League place should be very feasible for a squad with such attacking quality.